For other uses, see Shower (disambiguation). A shower is a place in which a person bathes under a spray of typically warm or hot water. Indoors, there is a drain in the floor. Most showers have temperature, spray pressure and adjustable showerhead nozzle. 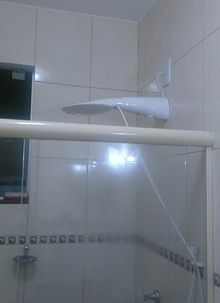 The simplest showers have a swivelling nozzle aiming down on the user, while more complex showers have a showerhead connected to a hose that has a mounting bracket. This allows the showerer to hold the showerhead by hand to spray the water at different parts of their body. A shower can be installed in a small shower stall or bathtub with a plastic shower curtain or door. 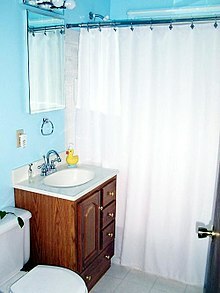 Showering is common in Western culture due to the efficiency of using it compared with a bathtub. Its use in hygiene is, therefore, common practice. [page needed] A shower uses less water on average than a bath: 80 litres (18 imp gal; 21 US gal) for a shower compared with 150 litres (33 imp gal; 40 US gal) for a bath. The original showers were neither indoor structures nor man-made but were common natural formations: waterfalls. The falling water rinsed the bathers completely clean and was more efficient than bathing in a traditional basin, which required manual transport of both fresh and waste water. Ancient people began to reproduce these natural phenomena by pouring jugs of water, often very cold, over themselves after washing. There has been evidence of early upper class Egyptian and Mesopotamians having indoor shower rooms where servants would bathe them in the privacy of their own homes. However, these were rudimentary by modern standards, having rudimentary drainage systems and water was carried, not pumped, into the room. The ancient Greeks were the first people to have showers. Their aqueducts and sewage systems made of lead pipes allowed water to be pumped both into and out of large communal shower rooms used by elites and common citizens alike. These rooms have been discovered at the site of the city Pergamum and can also be found represented in pottery of the era. The depictions are very similar to modern locker room showers, and even included bars to hang up clothing. [page needed] The ancient Romans also followed this convention; their famous bathhouses (Thermae) can be found all around the Mediterranean and as far out as modern-day England. The Romans not only had these showers but also believed in bathing multiple times a week, if not every day. The water and sewage systems developed by the Greeks and Romans broke down and fell out of use after the fall of the Roman Empire. The first mechanical shower, operated by a hand pump, was patented in England in 1767 by William Feetham, a stove maker from Ludgate Hill in London. His shower contraption used a pump to force the water into a vessel above the user's head and a chain would then be pulled to release the water from the vessel. Although the system dispensed with the servant labour of filling up and pouring out buckets of water, the showers failed to catch on with the rich as a method for piping hot water through the system was not available. The system would also recycle the same dirty water through every cycle. This early start was greatly improved in the anonymously invented English Regency shower design of circa 1810 (there is some ambiguity among the sources). The original design was over 10 feet (3 m) tall, and was made of several metal pipes painted to look like bamboo. A basin suspended above the pipes fed water into a nozzle that distributed the water over the user's shoulders. The water on the ground was drained and pumped back through the pipes into the basin, where the cycle would repeat itself. The original prototype was steadily improved upon in the following decades until it began to approximate the shower of today in its mode of operation. Hand-pumped models became fashionable at one point as well as the use of adjustable sprayers for different water flow. The reinvention of reliable indoor plumbing around 1850 allowed free-standing showers to be connected to a running water source, supplying a renewable flow of water. Modern showers were installed in the barracks of the French army in the 1870s as an economic hygiene measure, under the guidance of François Merry Delabost, a French doctor and inventor. As surgeon-general at Bonne Nouvelle prison in Rouen, Delabost had previously replaced individual baths with mandatory communal showers for use by prisoners, arguing that they were more economical and hygienic. First six, then eight shower stalls were installed. The water was heated by a steam engine and in less than five minutes, up to eight prisoners could wash simultaneously with only twenty liters of water. The French system of communal showers was adopted by other armies, the first being that of Prussia in 1879, and by prisons in other jurisdictions. They were also adopted by boarding schools, before being installed in public bathhouses. The first shower in a public bathhouse was in 1887 in Vienna, Austria. In France, public bathhouses and showers were established by Charles Cazalet, firstly in Bordeaux in 1893 and then in Paris in 1899. 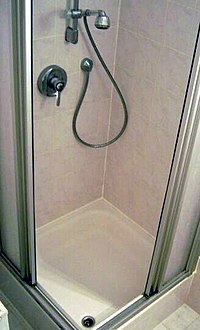 Domestic showers are most commonly stall showers or showers over a bathtub. A stall shower is a dedicated shower area which uses a door or curtain to contain water spray. The shower over a bathtub saves bathroom space and enables the area to be used for either a bath or a shower and commonly uses a sliding shower curtain to contain the water spray. Showers may also be in a wet room, in which there is no contained shower area, or in a dedicated shower room, which does not require containment of water spray. Most domestic showers have a single overhead shower head, which may be adjustable. Many modern athletic and aquatic facilities provide showers for use by patrons, commonly in gender segregated changing rooms. These can be in the form of individual stalls shielded by curtains or a door or communal shower rooms. The latter are generally large open rooms with any number of shower heads installed either directly into the walls or on posts throughout the shower area. Open showers are often provided at public swimming pools and at popular beaches. Military forces around the world set up field showers to enable the washing away of dangerous residue from modern weapons such as caustic chemicals, deadly biological agents, and radioactive materials, which can harm forces on both sides of a conflict. A wet room is a bathroom without internal dedicated or raised areas which has an open shower. Structurally, a wet room requires the bathroom to have a gradient or slope towards a drain hole, and a foul air trap connecting the floor to the waste pipes. Air shower, a type of bathing where high pressure air is used to blow off excess dust particles from cleanroom personnel. Digital shower, a shower system that works in a similar way to mixer or power showers, but provides more control over the temperature of the water with the use of a digital control panel. Eco shower, a shower system that comes in mixer or electric variations, but also features a regulator to regulate the flow of water with a view to saving water. Electric shower, a shower stall device to locally heat shower water with electrical power. Emergency showers, installed in laboratories and other facilities that use hazardous chemicals, are required by law in the United States; designed to deluge continuously at around 30–60 US gallons (110–230 l) per minute  for at least 15 minutes  and should be located at most 10 seconds away from potential users. Mixer shower, a shower system that takes water from existing hot and cold water supplies and combines them within the unit. Power shower, a shower stall device that works similarly to a mixer shower by mixing existing hot and cold water feeds, but locally increases the water pressure available to the shower head by means of an electric booster pump. Roman shower, a shower that does not use a door or curtain. Steam shower, a type of bathing where a humidifying steam generator produces steam that is dispersed around a person's body. 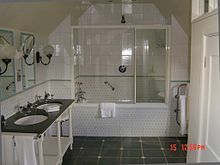 Vichy shower, a shower where large quantities of warm water are poured over a spa patron while the user lies within a shallow (wet) bed, similar to a massage table, but with drainage for the water. Glassfibre Shower Pod, a shower cubicle moulded using fibreglass, usually in a one piece construction, which makes it easy to fit, keep clean and leak free. Fixed shower heads—Traditional fixed shower-heads are mostly common shower-faucets because as they can easily connect to the plumbing fixtures with-out any additional hardware. Shower handsets—Hand-set shower-faucets are connected by a flexible hose, and can also mounted and used like a fixed shower-head. Ceiling-mounted faucets—Ceiling-mounted shower-faucets are typically rain-drop shower-heads mounted in one shower ceiling. Water-rains down, at low or medium pressure, using the gravity to shower on one from directly above. Adjustable shower heads—Adjustable shower faucets often have numerous settings, including the pulsating massage settings and high-pressure. Shower panels—Unlike a single showerhead, these are wall-mounted with sprayers aimed horizontally at various parts of the body. Shower usage in the latter half of the 20th century skyrocketed. Personal hygiene became a primary concern, and bathing every day or multiple times a day is common among Western cultures. [page needed] Showering is generally faster than bathing and can use less water. In an average home, showers are typically the third largest water use after toilets and clothes washers. The average American shower uses 17.2 gallons (65.1 liters) and lasts for 8.2 minutes at average flow rate of 2.1 gallons per minute (gpm) (7.9 lpm). Showering is one of the leading ways we use water in the home, accounting for nearly 17 percent of residential indoor water use, roughly equals to 1.2 trillion gallons of water annually just for showering. The U.S. Environmental Protection Agency recommend to retrofit home showers with a shower head that uses less than 2.0 gallons per minute to conserve water. However, many have hypothesized reducing flow rates of showerheads might cause users to take much longer showers. Other options to save water include using extra high pressure mist flow or design in sensors and valves to shut off or reduce water flow while people are not actively using the shower water. Various measures can be taken to increase safety for those, especially elderly people, taking showers or baths. When a person takes a shower may indicate their social position. Blue collar workers have been found to be more likely to take a shower in the evening after work, whereas white collar workers have been found to shower in the morning before work. [unreliable source?] Some people take more than one shower each day: in the morning, after working out, and at night. People also shower to cool off in hot weather. [better source needed] The ideal amount of showering may be less frequently than daily because showering, especially with hot water, can dry out and irritate the skin, remove beneficial bacteria, and cause small cracks that can lead to infection. [medical citation needed] According to some dermatologists, too much cleanliness for young children can lead to allergies or eczema. [unreliable medical source?] Used shower water can be employed as greywater. Designs for shower facilities vary by location and purpose. There are free-standing showers, but also showers which are integrated into a bathtub. Showers are separated from the surrounding area through watertight curtains (shower curtain), sliding doors, or folding doors, or shower blinds, in order to protect the space from spraying water. Showers with a level entry wet room are becoming very popular, especially due to improvements in waterproofing systems and prefabricated components. Places such as a swimming pool, a locker room, or a military facility have multiple showers. There may be communal shower rooms without divisions, or shower stalls (typically open at the top). Many types of showers are available, including complete shower units which are all encompassing showers that include the pan, walls, and often the shower head, as well as pieced together units in which the pan, shower head, and doors are purchased separately. Each type of shower poses different installation issues. Though the installation requirements of each of shower will differ, the installation of a shower in general requires the laying of several water transportation pipes, including a pipe for hot water and for cold water, and a drainage pipe. It is important that the wet areas of a bathroom be waterproof, and multiple layers of waterproofing can be employed. Grout is used to fill gaps between tiles, but grout and tile setting materials are generally porous. Tiles are generally waterproof, though a shower pan must be installed beneath them as a safety to prevent water leakage. Thus small mosaic tiles offer less of a defense than large format tiles. Sub-tile waterproofing is important when tiles are being used. Best practice requires a waterproofing material to cover the walls and floor of the shower area that are then covered with tile, or in some countries with a sheet material like vinyl. This diverter valve about to be installed behind a shower mixes hot and cold water. Some shower areas utilize a second emergency drain outside of the shower in case of overflow. In Australia and some European countries, plumbing codes require this second emergency drain (but not in the United Kingdom nor North America). A shower head is a perforated nozzle that distributes water over solid angle a focal point of use, generally overhead the bather. A shower uses less water than a full immersion in a bath. Some shower heads can be adjusted to spray different patterns of water, such as massage, gentle spray, strong spray, and intermittent pulse or combination modes. Hard water may result in calcium and magnesium deposits clogging the head, reducing the flow and changing the spray pattern. For descaling, various acidic chemicals or brushes can be used or some heads have rubber-like jets that can be manually descaled. A homemade remedy is to immerse it in a solution of water and vinegar for a while, since the vinegar is able to dissolve limescale. Some governments around the world set standards for water usage and regulate shower heads. For example, in the United States, residential and most commercial shower heads must flow no more than 9.5 liters per minute (2.5 gallons per minute) per the Department of Energy ruling 10 CFR 430. Low-flow shower heads, less than or equal 7.6 liters per minute (2.0 gallons per minute), can use water more efficiently by aerating the water stream, altering nozzles through advanced flow principles or by high-speed oscillation of the spray stream. USEPA administers a voluntary water saving program, WaterSense, which can certify low-flow shower heads. "Shower curtain" redirects here. For the physical phenomenon, see shower-curtain effect. Curtains can be used in shower or bathtub enclosures with two main purposes: to provide privacy and to prevent water from flooding or spraying outside the shower or bathtub area. Shower and bathtub curtains usually surround the bath inside the tub or shower area and are held up with railings or curtain rods high on the wall or ceiling. To accommodate the different types of bathtub shapes, railings can come in different sizes and are flexible in their design. 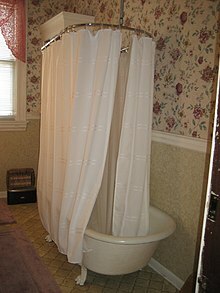 Some people use two shower curtains: one that is inside the tub, which is mainly functional or decorative as well, and an outer shower curtain, which is purely decorative. The bottom portion of the inner curtain often comes with magnetic discs or suction cups which adhere to the bathtub itself. These curtains are usually made from vinyl, cloth or plastic. Shower or bathtub doors are doors (also called screens) used in bathrooms that help keep water inside a shower or bathtub and are alternatives to shower curtains. They are available in many different styles such as framed or frameless, sliding or swing. They are usually constructed of aluminium, clear glass, plexi-glass or tempered glass. Shower doors can come in many different hardware finishes and glass patterns that can match other bathroom hardware such as faucets and shower heads. There are also shower doors that are in a neo angle design for use on shower pans that have the neo design as well. The design of the shower pan is extremely important as the shower door must be the type required for the pan in order to work. A shower door requires plastic lining along the edges of the door to protect against water leaking out. ^ a b c Shove 2004. ^ Gillespie, Ed (4 September 2009). "Let's talk dirty…how long do you spend in the shower?". The Guardian. Retrieved 9 May 2015. ^ a b "The Stand-Up Bath". 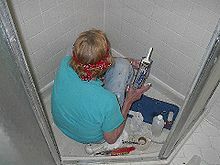 theplumber.com. Archived from the original on 30 November 2010. Retrieved 5 December 2010. ^ James & Thorpe 1995, p. 460. ^ Humphrey, Olsen & Sherwood 1998, p. 280. ^ James & Thorpe 1995. ^ "A 19th Century Regency Era Shower". Janeaustensworld. Retrieved 30 September 2013. ^ "History of Plumbing in America". Plumbing & Mechanical magazine. July 1987. ISSN 8750-6041. Archived from the original on 6 November 2008. Retrieved 6 January 2011. by 1845, the installation of sanitary sewers began to pay off ... In 1874, ... an unknown plumber solved the problem of venting. ^ Izak, Shcultz. "Shower heads Archives". Beyond Shower. Retrieved 2017-03-13. ^ Biot, Roger (2005). Fameux Rouennais, Rouennais fameux. Rouen: PTC-Normandie. ISBN 9782350380117. ^ Feltgen, Dr. (8 November 2000). "Dr. Merry Delabost, inventor of the shower?" (PDF). Hopitaux de Rouen. Archived from the original (PDF) on 12 January 2012. Retrieved 30 September 2012. ^ "1910.151: Occupational Safety and Health Standards — Medical services and first aid". Regulations (Standards - 29 CFR). Occupational Safety and Health Administration. 18 June 1998. Retrieved 1 June 2010. ^ Mayer 1995, p. 155. ^ Vincoli 2000, p. 343. ^ Brauer 2006, p. 533. ^ Rowan, Gerald; Sanford, Steve (2013). Compact Houses: 50 Creative Floor Plans for Efficient, Well-Designed Small Homes. North Adams, Mass. : Storey Publishing. p. 10. ISBN 9781612121024. ^ "Indoor Water Use". Alliance for Water Efficiency. Alliance for Water Efficiency. Archived from the original on 2018-10-24. Retrieved 30 October 2018. ^ "Showerheads". U.S.EPA. United States Environmental Protection Agency. Retrieved 30 October 2018. ^ "Curbless Showers - An Installation Guide" (PDF). NC State University. Retrieved 18 January 2017. Brauer, Roger L B (2006). "Personal protective equipment". Safety and health for engineers (2nd ed.). John Wiley and Sons. ISBN 978-0-471-29189-3. Humphrey, John W; Olsen, John P; Sherwood, Andrew N (1998). Greek and Roman Technology: A Sourcebook. New York: Routledge. ISBN 978-0-415-06136-0. James, Peter; Thorpe, Nick (1995). Ancient Inventions. New York: Ballantine. ISBN 978-0-345-40102-1. Mayer, Leonard (1995). "Emergency systems". Design and planning of research and clinical laboratory facilities. John Wiley and Sons. ISBN 978-0-471-30623-8. Oxford University Press, ed. (2009). Oxford New Desk Dictionary and Thesaurus (3rd ed.). Berkley. ISBN 978-0-425-22862-3. Shove, Elizabeth (2004). Comfort, Cleanliness and Convenience The Social Organization of Normality (New Technologies/New Cultures). New York: Berg. ISBN 978-1-85973-630-2. Vincoli, Jeffrey W (2000). Lewis' dictionary of occupational and environmental safety and health. CRC Press. ISBN 978-1-56670-399-4. Jones, Jerry (29 October 2004). "Decontamination shower system revamped". Reporter. Nashville, TN: Vanderbilt University Medical Center. Retrieved 5 December 2010. Mullick, Abir (2005). "Bathing for Older people with Disabilities". UB School of Architecture and Planning. Retrieved 5 December 2010.